SALT LAKE CITY, Utah — A police detective in Utah is now under investigation after angrily arresting a nurse and dragging her screaming out of the hospital when she declined to allow him to withdraw blood from an unconscious crash victim without a warrant, as per the police department’s agreement with the hospital. According to reports, on July 26, Utah Highway Patrol was involved in a chase with driver Marcos Torres, 26, in Cache County after he was reported for driving recklessly. Torres soon crossed into oncoming traffic and smashed into a semi head-on, which was driven by 43-year-old William Gray. The truck burst into flames. While Torres died from his injuries on the scene, Gray, who works as a reserve police officer when not driving semis, was transported to University of Utah Hospital, where he was treated for severe burns. Salt Lake Police Detective Jeff Payne later arrived at the hospital’s burn unit to request samples of Gray’s blood to determine if he had drugs in his system, as directed by another agency. However, on-duty nurse Alex Wubbels explained to Payne that he needed to meet one of three conditions as per the police department’s agreement with the hospital: 1) obtain consent from the patient 2) obtain a warrant or 3) the patient must be under arrest. As Gray was not under arrest since he was the victim in the incident, and as he was in a comatose state and was therefore not able to give consent, Wubbels outlined to Payne that he would need to obtain an electronic warrant. She proceeded to contact numerous supervisors to ask what to do about the situation. Becoming unhappy with her answers, Detective Payne repeatedly threatened that he was going to arrest Wubbels and take her to jail. “I either go away with blood in vials or body in tow,” he warned. With another staff member at her side to provide assistance, Wubbels soon printed out the hospital policy for blood draws and read it to Payne, advising him that he needs to meet one of the three conditions. “This is something that you guys agreed to with this hospital,” she explained calmly. Wubbels also placed one of the supervisors on speaker phone to talk to Payne about the matter himself. “So, I take it [that] without those in place, I’m not going to get blood. Am I fair to surmise that?” Payne asked. The supervisor, who advised Wubbels that she was simply relaying the information, then asked Payne why he was “blaming the messenger,” and he replied that it was because she was the one who was denying his request. She backed away from the officer, but Payne continued to move toward Wubbels and within seconds, he physically grabbed the nurse and forced her out the door. 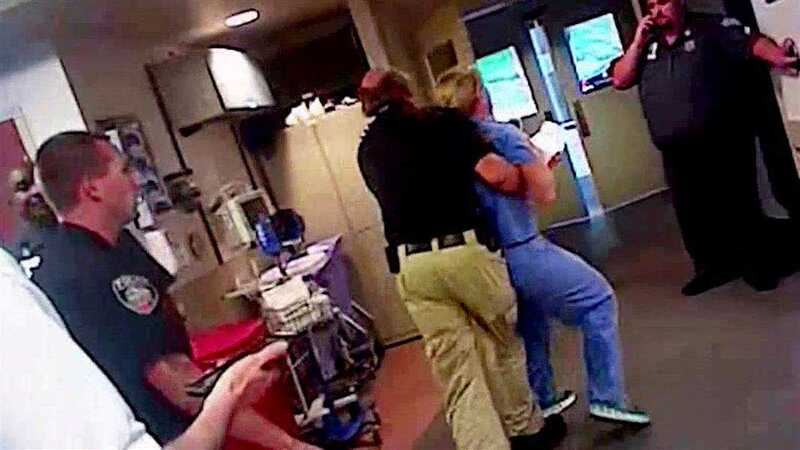 Other hospital employees tried to reason with Payne, who handcuffed Wubbles, but to no avail. “She’s under arrest,” Payne said. “For doing her job?” the employee asked. “I’ve done my job; she’s done hers,” Payne replied. Watch a video of the incident released by the Salt Lake Tribune here. Wubbles was released 20 minutes later, and has not been charged with any crime. Payne’s superiors are now investigating, and while he is still on active duty, he has been suspended from the police department’s blood draw program. According to the Salt Lake Tribune, Payne outlined in a report on the incident that he had been advised by Lt. James Tracy, the commander on duty that evening, to arrest Wubbles for interfering with a police investigation if she declined to allow him to take the blood sample. He said that he had been told that “implied consent” was sufficient. On Thursday, Wubbles went public for the first time in a press conference, during which she called for better police training. She said that she never told the officer no, but explained what he needed to do under the agreement. The Salt Lake City Police Department is re-training its officers on the blood collection policy, according to local television station KSL-TV. Watch a police press conference here in which police apologized for the detective’s actions. The outlet also notes that Wubbles and her attorney are concerned after hearing Payne, who also works as an ambulance driver, stating to another officer that he wondered how the arrest would affect his other job. “I’ll bring ’em all the transients and take the good patients elsewhere,” he was captured stating on his body camera.